Seems like lining up the freshest addition to one of the most iconic performance signature lines in the span of four months is a thing right now. Okay, I see you Nike. 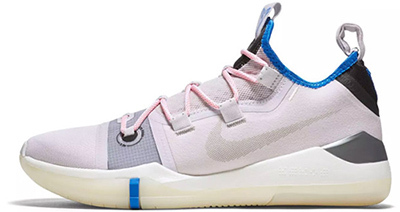 As much as I love doing reviews on Kobe’s latest performance models, even though, none of them actually fit my play style, I didn’t expect to set my eyes on something new from it this year again. Well, this was a pleasant surprise. 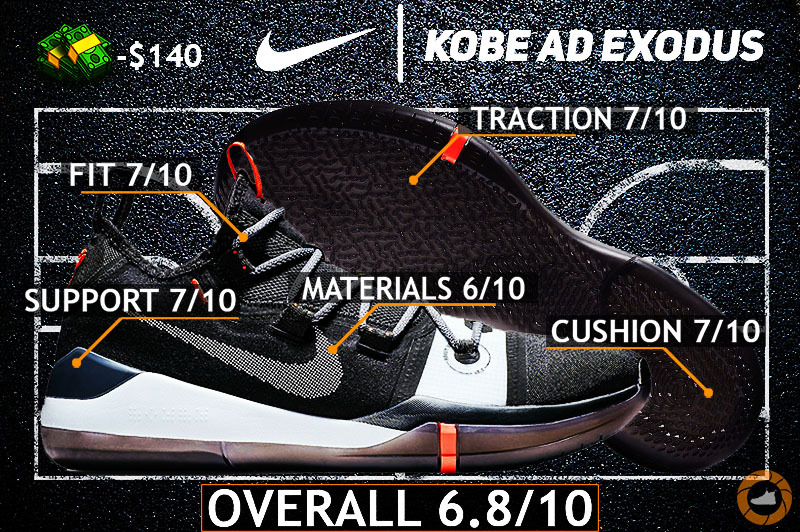 So without further ado, let’s dive into the Nike Kobe AD Exodus performance review! The price decrease has really reflected on the AD Exodus’ upper which made me hard time to wrap around my head the fact that I’m wearing a flagship model. Though there’s no need to panic yet since it applies more to how they do feel in-hand & on-feet, rather than overall performance taking a significant damage. Talking about performance, all materials as one unit did a decent job doing all that uppers usually do – comfort/containment/support was more or less on an average side for me, nothing “wow” for sure. Obviously, I didn’t expect them to house the same amazing 360-degree Flyknit from the Kobe AD 360 – that is for 200$ joints according to Nike. Yet, the AD “Exodus” still comes in a premium price range of 140$ which should easily give you a nice full-length Flyknit, like on the KD 11 or maybe more cost efficient tooling as mesh set-up on the Kyrie 4. Unfortunately, none of that landed on the Exodus. Starting off with the front, the toe box features a paper-thin mesh layer along with a medium-sized fuse layer on top to protect that mesh from taking severe damage. Trust me, that stuff is not ready for outdoor ballin’ since I don’t even know how long do they going to last for me indoors. But that wasn’t the main issue I had… That I’m going to cover in the FIT department. 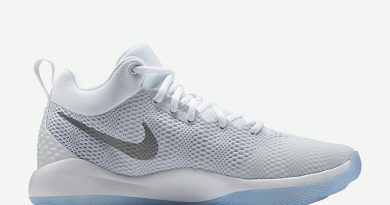 Now taking a quick glance at the midfoot, you’ll be immediately welcomed with the composite fiber 2.5x technology (that silver wrap) which, yes, heavily resemblance the Kyrie 3. But rather than a simple fuse & mesh contraption on the Kyrie 3, this current stuff on the AD is vastly stronger/sturdier containment piece, basically, absorbing everything you throw at it. Continue looking further, we stumble across the synthetic suede panel that goes all the way down the heel area. As far as performance goes I can only say positive things about it – it acts as a reliable sidekick for that composite fiber midfoot wrap by making sure that lateral coverage is always A-1 no matter what. Unfortunately, it ages so freaking badly that you can see every single scratch you’ve got from the last ball session – it REALLY kills the esthetics. The rant continues, well, sort of. I did have some love-hate relationship with this whole tooling as it’s definitely not for everyone to enjoy. 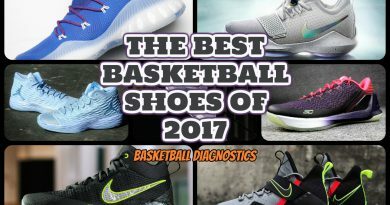 Looking from a power forward/center perspective – I know it’s pretty useful information for some of you since the majority of sneaker reviewers play in guard position – the heel section just simply shocked me, in a good way, of how much compression & impact protection does it packs, and how little does it feel like any other past Kobe shoe. I mean, yeah, the heel houses a freaking 14mm. bottom-loaded Zoom Air pillow – what did you expect, huh? To be honest, it was probably my very first time when I completely enjoyed the rare section of the cushion in a Kobe’s shoe due to offering everything that I need as a player who uses heel quite often & requires as much impact protection as possible. Now moving on to the front, this is where things get not so exciting, so to speak. The forefoot being only plain phylon – no Air, no REACT or even Lunarlon – brought me back again to the same question… Does it worth 140$? The answer is NO. Obviously, that should not apply to everyone. Personally, I would love to see a thin Air pillow in front not only because I’m a bigger dude and I need cushion in every spot possible, but only for heavy forefoot strikers & explosive players as well. I know for sure they would agree with me on that. Instead, we’re dealing with a rather low platform with plenty of court feel and responsiveness to go with. So if you’re looking for a balance between low/responsive front & high/soft ride in the back then the Exodus is all about that. The AD Exodus shares the same micro-nub traction pattern and makes a small update to its spacing. Wait… We’ve seen this already… Oh, yeah. This is basically the same scenario as with the LeBron 15 Low borrowing the same traction from the 15 but changing up a few pieces in order to improve upon performance. So with that in mind, I strongly believed that this is gonna be the same outcome and we’ll finally witness a section where they truly unfold. Unfortunately, despite the pattern being renewed, performance remains as it was on the AD NXT 360 which isn’t eventually a bad thing. So the main problem that keeps this traction from taking a top spot on the list was & still is dust accumulation. Prepare yourself mentally to take advantage of any free second you have on-court by wiping down your bottoms as clean as possible to bring back that semi-good bite alive. Once you are done cleaning, it takes approximately two or three positions for bottoms to cloth up again. Not gonna lie, for a dude that’s not a heavy bottom wiper, it took some time & nerves to get used to this. So again, the more you take care of them, the better they perform. Oh, right, rubber on these is as sensitive as your girl in the morning which means that outdoor usage is highly not recommended. A semi-narrow construction comes standard in basically all the Kobe’s so the AD Exodus being that way wasn’t any surprise really. Yet wide footers should have that in mind when picking up a pair for themselves since they don’t feature highly-stretchable materials, like Flyknit. That being the case, trying them in store first is highly recommended. Whereas for narrow/regular footers I recommend going true to your Nike size. Except for the ugly toe box – the rest of the shoe did feel a slightly above average but never as a top-of-the-line signature model, which it is frankly. Although, there were a few pieces that I’d like. First one being those suede panels on the sides – I didn’t like how it withstand wear – but as far as performance goes it acted well as a wall for my foot to hold on when moving laterally. Also, that awesome mesh under the lacing & that giant pull tab made it easy and comfortable to put them on or off. Now, what was wrong with the toe box, huh? Well, I had that issue where that freaking toe area would wave/bubble up above my fingers once I tighten up the laces, leaving me with a ton of unneeded space & no containment in that area whatsoever. Oh, and that definitely doesn’t the aesthetics either. 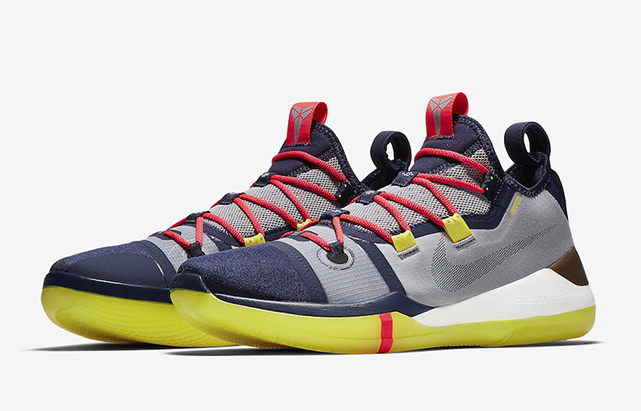 Like every other Kobe from the collection – these aren’t completely about that support life also – I feel like they’re hovering over somewhere in the middle. Again, the toe area was complete trash… Meanwhile, the midfoot section was all good, yet I wish it did have a tad bit wider platform or more aggressive outrigger to work better in tandem with that composite fiber strap & suede panels to completely lock down your foot upon lateral movements. Still, lateral coverage was solid so don’t worry about that, unless, you’re Russel Westbrook. Finally, the rare section does feature both internal and external heel counters so expect some pretty solid side-to-side/back-and-forth heel coverage. However, same thing as with the midfoot, I wish they did have more drastic heel sculpt since now I can take them off pretty easily without undoing the laces. It would have been a much better idea for Nike to spend these few last months of this year polishing off the Kobe AD Exodus and hold the release for the upcoming year. There was no need to rush things up really – the Kobe AD 360 came out only four months ago so what the hell Nike? Anyway, judging the stuff that we have right now, the AD Exodus was definitely a heavy disappointment for me, and I’m pretty sure for many of you as well. Aside from higher than average traction performance & really awesome heel cushioning – other departments were somewhat lacking. A few bits and pieces of greatness showing off in certain areas isn’t the way that a signature sneaker should be, especially coming at a 140$ price tag. 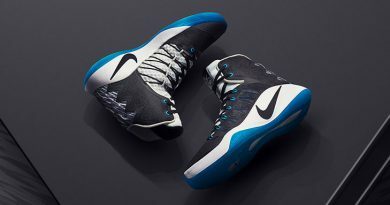 I feel like Nike basketball, in general, is now experiencing a small drop in terms of their main models struggling to deliver the greatness on the court – the KD 11 losing to a slipper in the battle of which has better support, and now this happened… Hope they will redeem themselves with the upcoming LeBron 16s. Fingers crossed. Hope you enjoyed my Performance Review on the NIKE KOBE AD EXODUS. Will you be picking them up? Let me know! ← Under Armour HOVR Havoc Low REVIEW – 100$ KILLER! Do you own a pair yourself or it’s just a random opinion based on pictures or spec sheet?